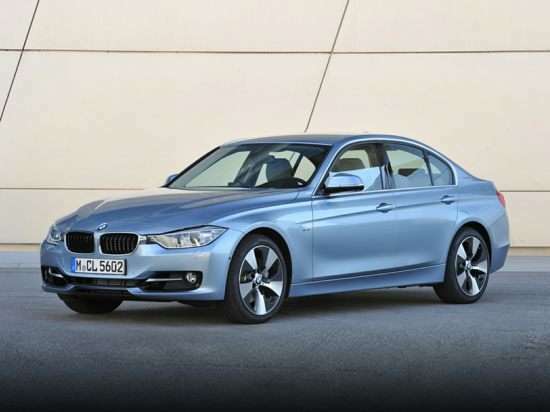 With the arrival of the 328d Sedan, which gets as much as 37 mpg in combined driving, one might assume that the ActiveHybrid 3 model’s days are numbered. Time will tell, but for now the powerful gas-electric hybrid variant returns for the 2014 model year. There’s just one version of the 2014 BMW ActiveHybrid 3, and it can be upgraded with Luxury Line, Sport Line, and M Sport Line option packages that provide the car with a little extra flavoring. Metallic paint, several wheel designs, leather, and a remarkable number of options can be added to the already expensive ActiveHybrid 3. What makes the ActiveHybrid 3 special is that it pairs a turbocharged 3.0-liter inline 6-cylinder engine with an electric motor and a lithium-ion battery to produce a combined 335 horsepower. A unique 8-speed automatic transmission power the car’s rear wheels, an automatic stop/start system turns off the gasoline engine while the car is idling, and a Driving Dynamics Control system features an EcoPro driving mode designed to maximize fuel economy. According to the EPA, the ActiveHybrid 3 gets 28 mpg in combined driving. That’s +3 mpg over the 335i, which isn’t quite as powerful but also weighs less. That’s also -9 mpg below the new 328d, which is also more than $11,000 less expensive than the ActiveHybrid 3. The National Highway Traffic Safety Administration (NHTSA) and the Insurance Institute for Highway Safety (IIHS) have not performed crash tests specifically on the ActiveHybrid 3 model. A standard BMW 3 Series Sedan earns a 5-star rating from the NHTSA, and “Good” ratings from the IIHS in all tests except the small overlap frontal-impact assessment, for which it receives a “Marginal” rating. In addition to its fairly sophisticated gas-electric hybrid drivetrain, the BMW ActiveHybrid 3 can be optioned with a number tech-related upgrades including, oddly, BMW Assist eCall with SOS Emergency Request and Automatic Collision Notification services, items that are standard on other 3 Series models. Highlights from the list of upgrades include heated front and rear seats, a heated steering wheel, a reversing camera, parking assist sensors, a navigation system, a premium sound system, and enhanced Bluetooth and USB connectivity with smartphone integration and BMW Apps. Several safety-related systems are also available, including an Active Driving Assistant, Active Blind Spot Detection, a Side and Top View Camera system, and automatic high beam headlights. Active cruise control is also offered for the ActiveHybrid 3, along with a Parking Assistant feature that can help the driver identify a parallel parking space that is large enough for the car, and then steer the car into the space while the driver operates the transmission, the brake, and the accelerator.